Perfume Genius is the stage name for Seattle-based solo artist Mike Hadreas. Hadreas is of Greek descent and was born in the suburbs of Seattle, Washington. Hadreas studied painting in school and took piano lessons as a child. His mother was a special education teacher, and is now an assistant principal at a middle school. His parents divorced when he was a teenager. Growing up, Hadreas was the only openly gay student at his school, and he received death threats which were not addressed by the administration. He dropped out of high school during his senior year. Two years after dropping out, he was attacked by several young men in his neighborhood. He moved to Williamsburg, Brooklyn, and worked as a doorman for a club in the East Village. In 2005, Hadreas returned home to Seattle and began recording music. 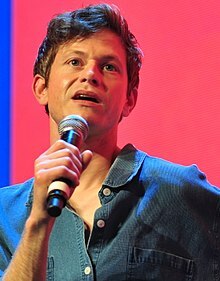 In 2008, Hadreas set up a MySpace page under the name Perfume Genius, and thus began his music career. Hadreas's music explores topics including sexuality, his personal struggle with Crohn's disease, domestic abuse, and the dangers faced by gay men in contemporary society. He performed his first live show at The Vera Project in Seattle, where he opened for A Sunny Day in Glasgow. Hadreas's second album, Put Your Back N 2 It, was released on February 20, 2012. Again, Hadreas received praise from music critics and fans alike for the sonic intimacy his music achieved. The promotional video for the album, featuring Hadreas and pornographic actor Arpad Miklos embracing each other, was deemed unsafe for family viewing by YouTube. Hadreas was one of several Seattle-area artists and musicians featured in the exhibit "Mw [Moment Magnitude]" at the Frye Art Museum, October 13, 2012 – January 20, 2013. As part of the exhibit, he performed at the museum on October 27, 2012. On September 23, 2014, Hadreas released his third album, Too Bright, which was co-produced by Adrian Utley of Portishead, to critical acclaim. The album was a transformative leap for Hadreas and marked a new trajectory in his career. The album received rave reviews from an array of publications. Pitchfork gave the album a 8.5 and commented that "these songs feel less like songs and more like treasures, ones that fill you with power and wisdom." Following the release of the album Hadreas toured the album and played sold out headline shows. On October 30, 2014 Perfume Genius appeared on The Late Show with David Letterman performing "Queen" from the album Too Bright. In April 2015, Hadreas was featured on the cover and in the pages of Hello Mr.
Hadreas contributed a cover of The Grateful Dead's "To Lay Me Down" to Day of the Dead, a charity tribute album curated and produced by members of The National and released by 4AD on May 20, 2016. Hadreas's cover was a collaboration with Sharon Van Etten. All profits from the album will help fight for AIDS/ HIV and related health issues around the world through the Red Hot Organization. On September 16, 2016 Hadreas released a cover of Elvis's "Can't Help Falling in Love" in collaboration with Prada. The song was featured in the ad campaign for Prada's La Femme and L'Homme fragrances. Hadreas was featured on the cover of the March/April 2017 issue of The Fader, which included a lengthy feature on Hadreas and his work on the next album. In the weeks following the article, Hadreas posted a number of video and audio clips teasing new music. On March 21, 2017 Hadreas announced his fourth studio album No Shape and released the first single "Slip Away", which was accompanied by a music video directed by frequent Bjork collaborator Andrew Thomas Huang. The single was designated "Best New Track" by Pitchfork. On April 19th, Hadreas released another single from the album called "Go Ahead" during a live Twitter Q&A with fans. No Shape was released via Matador on May 5. It was produced by Blake Mills (Fiona Apple. John Legend, Alabama Shakes). The album was praised by critics. Pitchfork awarded it an 8.8 and named it "Best New Album", deeming it "his most realized album yet, a tender and transcendental protest record of love and devotion." The Guardian commented that "No Shape sounds like a unique talent coming into full bloom." Perfume Genius appeared on The Late Show with David Letterman on October 30, 2014 performing "Queen" from the album Too Bright. He appeared on The Late Show with Stephen Colbert on May 5, 2017 performing "Slip Away" from the album No Shape. ^ turnstilemusic (25 September 2015). "Penblwydd Hapus / Happy Birthday @perfumegenius x" (Tweet) – via Twitter. ^ "Perfume Genius: Too Bright". Rolling Stone. Retrieved 11 August 2016. ^ "10 Best Albums of 2014". Entertainment Weekly. Retrieved 11 August 2016. ^ "Perfume Genius Put Your Back N 2 It". cokemachineglow.com. Retrieved 11 August 2016. ^ "Perfume Genius Too Bright Matador". Under The Radar. Retrieved 11 August 2016. ^ a b c d William Van Meter (17 September 2014). "Lashing Out at His Tormentors, At Last". The New Yorker. Retrieved 26 June 2015. ^ a b c d e f Sasha Frere-Jones (22 September 2014). "Growth Spurt". The New Yorker. Retrieved 26 June 2015. ^ a b Wright, Matthew (11 June 2015). "Perfume Genius / Jenny Hval, RFH". The Arts Desk. Retrieved 26 June 2015. ^ Crawford, Anwen (22 June 2015). "Soft Apocalypse". The New Yorker. Retrieved 26 June 2015. ^ Michelson, Noah (January 25, 2012). "Perfume Genius Video Gets Banned From YouTube For Not Being "Family Safe"". Huffington Post. ^ Perfume Genius & Calendar, Mw [Moment Magnitude], Frye Art Museum. Accessed online 2012-11-27. ^ a b "Perfume Genius Performs "Queen" on "Letterman"". Pitchfork. Retrieved 2014-10-31. ^ Nichols, JamesMichael. "Hello Mr. Lands Perfume Genius' Mike Hadreas For The Cover Boy Of Its New Issue". Huffington Post. Retrieved 20 September 2016. ^ "How Perfume Genius Grew Up And Started Thriving". thefader.com. Retrieved 2017-02-21. ^ "Perfume Genius Announces New Album No Shape, Shares Video for New Song "Slip Away": Watch | Pitchfork". pitchfork.com. Retrieved 2017-03-21. ^ "Best New Track "Slip Away"". pitchfork.com. Retrieved 2017-03-21. ^ "Perfume Genius No Shape". pitchfork.com. Retrieved 2017-05-05. ^ "Perfume Genius No Shape Review". theguardian.com. Retrieved 2017-05-05.